CARSFAD DAM AND POWER STATION are situated in scenes of majestic desolation. The dam across the River Ken at Carsfad has a length of 1,270 feet. 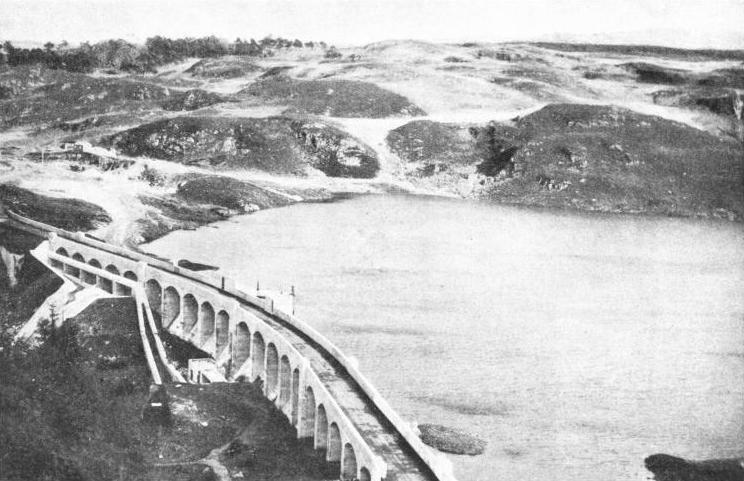 The western arm forms the eastern bank of the intake channel, which leads the water through sluice gates to twin reinforced concrete aqueducts of 13 ft 6-in diameter. These aqueducts were laid in an open trench. 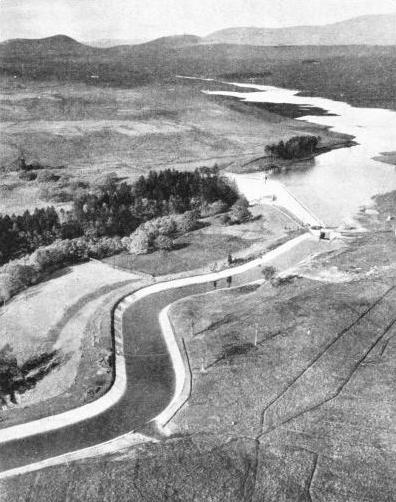 The photograph clearly shows the tailrace from the power house to the Ken, the spillway channel (centre) and the fish ladder provided for salmon to pass the dam. SCOTLAND is an ideal locality for the development of hydro-electric power schemes. There is enormous potential energy in this land of innumerable lochs, many of them over 1,000 feet above sea level. At every turn the roar of a mountain torrent may be heard, in every valley a considerable stream rushes down to lose its energy when it meets the sea. Until comparatively recently all this power has been wasted. In a country so sparsely populated little use could be made of the water’s energy. The main industries, as in England and Wales, were centred in the coal-bearing districts. The increasing use of electricity made it possible to consider using this latent natural power. To see a Scottish loch high up in the mountains collecting all the waters that pour down from the snows, and emptying those waters down through the valleys, is to visualize a great barrage by which all that wasted energy may be conserved. The reaction is automatic in any imaginative mind. Modern engineering has been able to make that ideal a reality. The natural energy of mountain waters can be made to operate turbines, can be translated into electrical energy and transmitted as required to other parts of the country. This is what engineers have already done in Scotland. In numerous districts dams have been built and the water power has been controlled, to be used for man’s various requirements. Already a continuous output of more than 300,000 kilowatts comes from Scotland’s hydro-electric stations. The majority of these stations are situated in the Highlands, where the average rainfall is about 80-in a year, reaching a maximum of 164-in on Ben Nevis, the highest mountain in Great Britain. In Southern Scotland the rainfall is less. Although not so mountainous, the Lowland country is everywhere hilly and often extremely bleak and wild. In the south-west of Scotland is a district of hills, moors and valleys known as Galloway. Numerous rivers and lochs cover the landscape in this area, which has an average rainfall of from 40 to 60-in a year. The two main rivers in the Stewartry of Kirkcudbright are the Rivers Dee and Ken. These rivers have their sources in hills which rise to a height of more than 2,500 feet. Under the Galloway Water Power Act of 1929 a great scheme was embraced for the development of this area as a source of electrical power for industrial use. From a catchment area of 400 square miles it was estimated that power equivalent to 20,000 kilowatts at continuous load could be developed. AN OPEN AQUEDUCT, or canal, leads the water from the eastern end of the Ken dam to the reservoir formed by a dam across the Blackwater Burn. The water is then led to Kendoon Power Station. The canal aqueduct between the two reservoirs is lined with concrete and runs for 2,500 feet. So far-reaching is the project that engineering works have altered the topography of the area. The headwaters of the Dee have been impounded to form a large artificial loch, Clatteringshaws Loch, which has a capacity of 1,250 million cubic feet. The waters of Loch Doon naturally empty through Ayrshire. Now the waters can be used to supplement the Galloway water area. The Black Water of Dee used to join Loch Ken. Most of the waters are now carried in a tunnel 19,050 feet long to Glenlee Power Station and pass into the River Ken about, ten miles farther upstream than before. In all, the scheme comprises five separate power stations, several reservoirs and a large number of dams, tunnels, aqueducts, pipe lines and other engineering works. The scheme, which was completed in 1936, cost about £3,000,000. 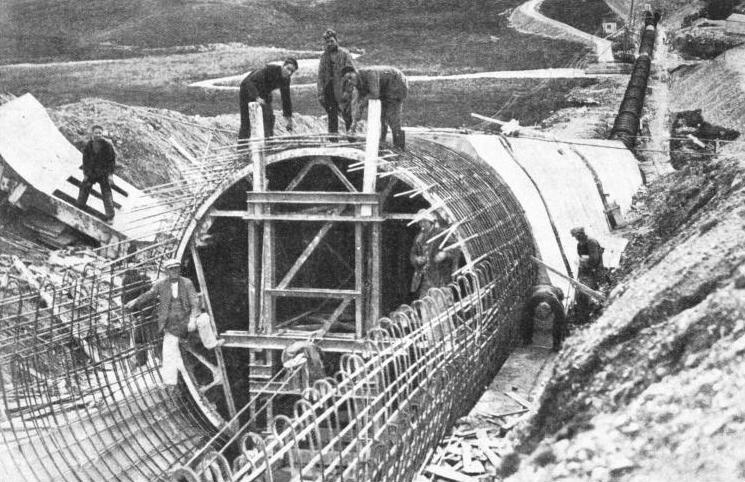 One of the largest engineering works involved in the scheme was the building of Clatteringshaws Dam, which created a reservoir about two miles long. The dam has a length of 1,500 feet and is built in a curve with a radius of 3,000 feet. Work started in September 1932. Percussion drills excavated holes 20 feet deep to carry the foundations into solid natural granite. 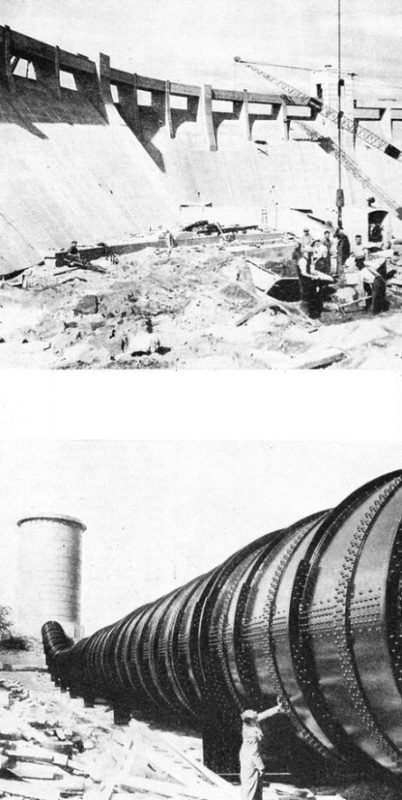 Pipes were inserted in the holes and grout was forced in so that the entire length of the dam between the extreme abutments was founded on cemented rock. The dam was built up in sections about 50 feet long. Heavy steam jib cranes, running on rails, with a capacity of up to fifteen tons supplied concrete from the main crushing and mixing plant, which was placed near the eastern end of the dam. Between the 50-feet sections a clear space of 6 feet was left to allow for the contraction of the concrete on cooling. When the concrete had fully cooled and contracted, the spaces were filled in. While the work was in progress openings through which the river passed were left in the structure. One of the provisions of the Act was that the flow should not be allowed to fall below twelve million gallons a day at a point seven miles below the dam. Thus special attention had to be paid to the outlet in the centre of the dam. The outlet consists of a 72-in steel-plate lined culvert through the dam, closed on the upstream face by a free rolling emergency gate. The flow is controlled by a mechanically-operated needle valve. The water from the reservoir is taken down to Glenlee Power Station in the Ken Valley through a tunnel of horseshoe section 19,050 feet long. The intake to the tunnel is not near the dam itself, but some one and a half miles away on the eastern bank of the reservoir. The water from the reservoir is diverted to the intake tower of the tunnel through a canal 44 feet wide and 2,300 feet long. The sloping banks of this canal or channel were lined where necessary with concrete, although at many points the natural rock formed a suitable revetment. So that the intake tower may be inspected, water gates across the canal can be used to stop the flow of water. The intake tower is a reinforced concrete structure with a total height of 98 ft 9-in. It is a circular shaft with an external diameter of 17 feet above ground level, and below ground level the walls are concreted solid against the excavated rock. The base of the tower is connected to the tunnel through a bell-mouth opening with vertical sides lined with reinforced concrete. The transition from the elongated mouth to the normal tunnel takes place in a length of 22 feet. The tunnel was excavated to full diameter in free air and without a heading, except at one point. The internal diameter of the upper section of the tunnel is 11 ft 6-in. The internal diameter of the invert is 30 feet. Excavation was undertaken from either end of the tunnel simultaneously, and the maximum rate of progress was about 100 feet a week. The rock surface was roughly dressed and a smooth concrete lining was applied. BUILDING THE EARLSTOUN DAM. The arch section of the dam, built across the River Ken, is 282 feet long on a radius of 145 feet. The upstream face is vertical and there is a slight batter (slope) on the downstream face. Openings had to be left in the dam while work was in progress to allow the waters of the Ken to pass through. With the exception of the centre opening, into which was built an outlet conduit closed by a valve, the openings were filled in to complete the work. 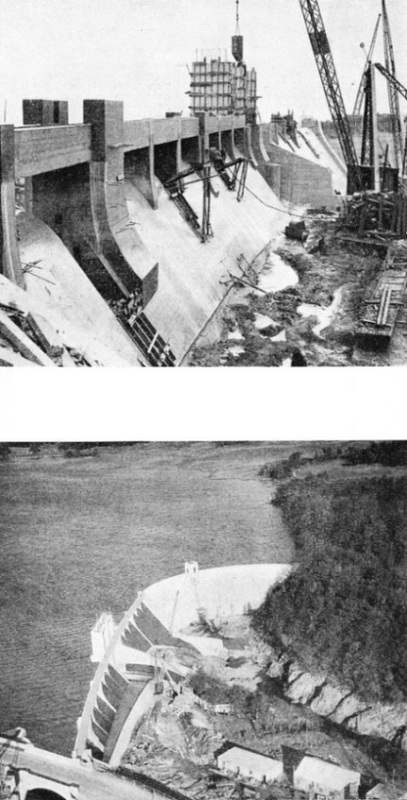 Spillways and flood gates were provided in the gravity section of the dam. About half-way along the course of the tunnel a further supply of water enters the tunnel through a shaft from Craigshinnie Burn. Across this stream a weir was built a short distance from the line of the tunnel. Above the weir excavations were made to form a small basin or forebay, from which the water was led through an inverted mushroom siphon into the shaft. The head of the siphon was connected to a length of 12-in pipe which ends in a contracted nozzle about 30 feet above the bottom of the shaft. The shaft, which was opened for constructional purposes, was closed, leaving only an access pipe of 4 ft 6-in diameter to accommodate the siphon piping and a galvanized ladder. If a sudden closing down of the turbines causes an excessive pressure of water in the tunnel, means must be found for relieving this excess pressure automatically. This is done by building a surge shaft. The shaft is driven from the tunnel to the surface at a point along the line of the tunnel. Thus, when the pressure becomes oppressive, the water will automatically surge up the shaft and overflow at the surface until the pressure in the tunnel has been relieved. The surge shaft of the Glenlee tunnel was built 700 feet from the Glenlee end. It has a diameter of 24 feet, and was sunk from the hillside to meet the tunnel at a depth of 142 feet. At the surface the shaft has a concrete lip 5 feet high, in which openings have been cut. In the event of a surge the water will overflow through these openings into an artificially formed reservoir. This impounds the water until the surge has subsided, when the water sinks back down the shaft into the tunnel. Near the bottom of the surge shaft a large chamber, 105 feet long and about 24 feet high, was driven horizontally. This chamber accommodates sufficient water to keep the tunnel fully charged if the full load were suddenly to be switched on at the power station. THE SURGE SHAFT in the Glenlee tunnel is 142 feet deep and 24 feet in diameter. This sectional diagram shows the arrangement of embankments on the surface which impound surge water until the pressure in the tunnel has subsided. The large chamber at the foot of the shaft stores sufficient water to prevent the pressure in the tunnel from being suddenly lowered when a full load is switched on. The Clatteringshaws end of the tunnel is 520 feet above Ordnance Datum. The outlet, of the tunnel is 439 ft 6-in above Ordnance Datum. From the tunnel to the Glenlee Power Station the water flows through 1,700 feet of steel pipe line. The connexion between the tunnel and the pipe line is effected through a 120-in butterfly valve in a concrete valve house. This valve controls the flow of the water from tunnel to pipe. The steel pipe was manufactured in lengths of 24 feet and hauled up the side of the hill on bogies running on a narrow-gauge track. When they had arrived at their respective positions, the lengths of pipe were skidded sideways into place. The total weight of the pipe line is 630 tons. The diameter decreases in three steps, between the tunnel and a bifurcation near the power house, from 9 ft 6-in to 8 ft 4-in. From the bifurcation pipes of 6 feet diameter carry the water to the turbines. The two turbines at Glenlee develop 16,000 horsepower each. There are, in addition, two 750 horsepower auxiliary turbines. The main turbines are each connected to an alternator which generates three-phase current at a pressure of 11,000 volts. The water discharged from the turbines passes into the River Ken along a tailrace 900 yards long. A metal grating prevents fish from swimming up the tailrace. THE DOWNSTREAM FACE of Clatteringshaws Dam, which was built across the Black Water of Dee to form an artificial lake about two miles long. The foundations of the 1,500-feet dam were driven 20 feet down into the solid granite. 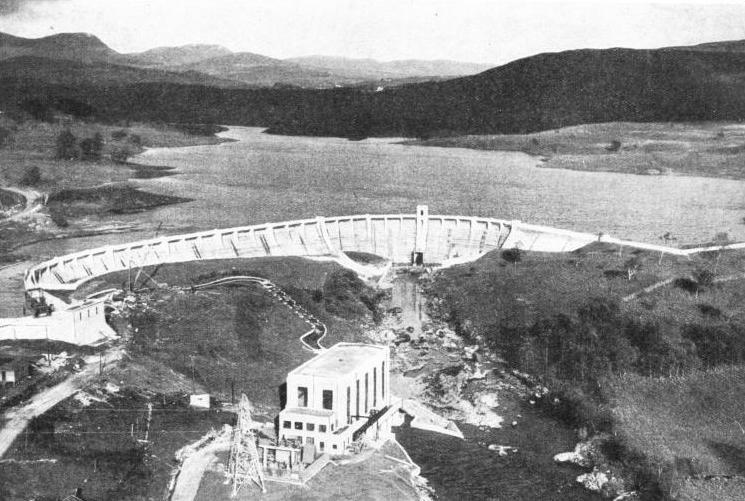 The dam was built in 50-feet sections, with a space of 6 feet between each to allow the concrete to contract fully on cooling before the spaces were filled in. Of the five power stations in the Galloway scheme, there are three above and one below Glenlee. The three power stations above Glenlee are situated at Earlstoun, Carsfad and Kendoon. These three power stations have been built to operate in conjunction with one another and they use the same water. Water from the Kendoon station, which is farthest upstream, flows into the reservoir for the Carsfad station. Similarly, the water from the Carsfad turbines is collected in the reservoir for the Earlstoun station, lower down. An interesting feature of the arrangement for the impounding of the water for the Kendoon turbines is that water can be collected from a source which is not in the watershed of the River Ken. The waters from Loch Doon normally flow down the River Doon westwards to Ayr. Through a tunnel which has been driven under the ridge of hills which separates Loch Doon from the Ken watershed water can be drawn off Loch Doon into the catchment area of the Galloway scheme. A dam was built across the northern end of Loch Doon. This raised the level of the loch by about 27 feet and increased the water surface to 2,250 acres, thus storing 15,000 million gallons of water, exclusive of the storage of compensation water for the River Doon. 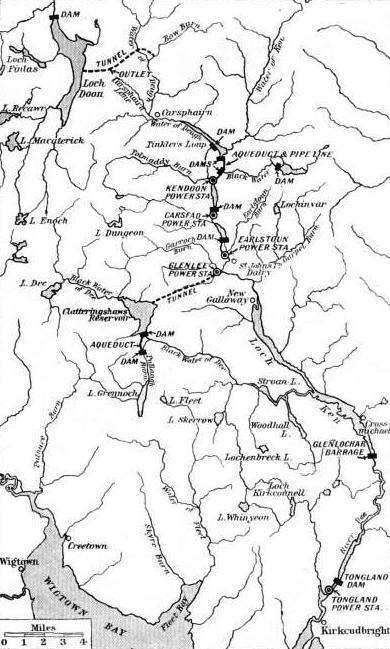 Water from burns which flow into the loch from the hills to the south and west is thus drawn upon by the Galloway scheme, which in this way makes use of an additional catchment area of about 50 square miles. One of the problems which the designers of this ambitious scheme had to face was how they could best discharge the waters from Loch Doon into the system of reservoirs which was to supply Kendoon Power Station. A tunnel was the only practicable means of conveying the water. The hill under which the tunnel from Loch Doon is driven is called Cullendoch Hill. On the eastern face of this hill at Drumjohn is a small burn, a tributary of the Water of Deugh, known as Carsphairn Lane. The tunnel from Loch Doon discharges into this burn, and the water thus flows down a natural watercourse until it reaches the reservoir at Kendoon. THE GALLOWAY POWER SCHEME embraces a catchment area of 400 square miles, the watershed of the Rivers Dee and Ken. Additional water from Loch Doon is drawn into the Ken watershed through a tunnel. The first three power stations, Kendoon, Carsfad and Earlstoun, draw water from the Ken watershed. Glenlee Power Station is operated by water from Clatteringshaws and all the water from these stations later helps to operate the turbines at Tongland. The driving of this tunnel was a problem more complex than that of the much longer Glenlee tunnel. The first 400 feet of the Loch Doon tunnel had to be driven through moraine material. Moraine is the debris of rocks brought down by a glacier. This part of the tunnel was so treacherous that special precautions had to be taken. Compressed air was used for a distance of 200 feet and the excavation was undertaken in short lengths at a time. As the excavation proceeded, a lining of brickwork had to be built and an internal lining of reinforced concrete 4-in thick superimposed. The remainder of the tunnel, which has a length of 2,200 yards, was driven in free air and excavated to the full diameter, working from the Carsphairn Lane, or Drumjohn entrance. The spoil, as the excavated material if called, was loaded into small wagons in the tunnel by pneumatically operated scrapers. When the complete tunnel had been excavated, the rock was roughly dressed and lined with concrete to an average thickness of 7-in, thus bringing the internal diameter to 8 ft 3-in. A patch of moraine occurred also at the Carsphairn Lane end of the tunnel and reinforced concrete was used to strengthen the tunnel at this point. The burn of Carsphairn Lane is 320 feet from the end of the tunnel. This distance is crossed by a length of riveted steel pipe with a diameter of 8 feet. By an ingenious piece of civil engineering the sources of the Water of Deugh, which are in the Ken watershed, are diverted by a dam into a second tunnel, which conveys the water to Drumjohn and thence through the Loch Doon tunnel to the loch. Thus by a clever arrangement Loch Doon, which is in the western catchment area, acts as a storage reservoir for some of the waters rising in the eastern catchment area. Then, when required, the waters stored in Loch Doon can be brought back through the tunnel and at Drumjohn can be discharged back into the Ken catchment area. This has been achieved by building a series of dams and other waterworks. 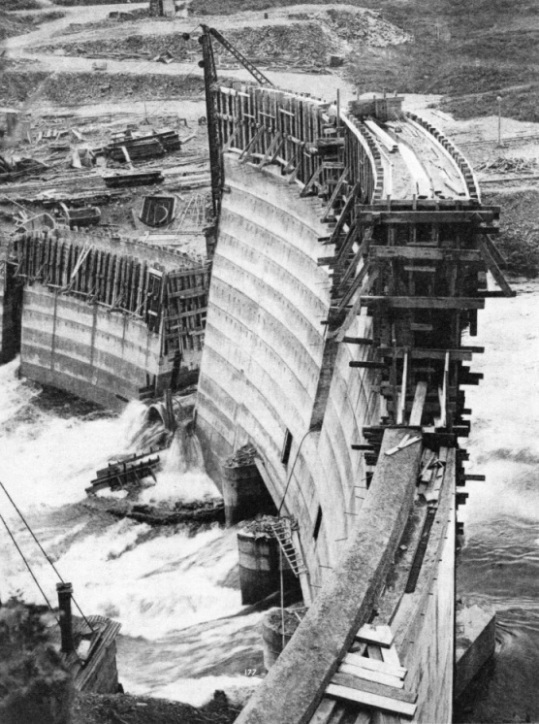 BUILDING THE CARSFAD DAM. The workmen are engaged on building the spillway channel which diverts the water that spills over the gravity dam back into the bed of the River Ken. The end of the straight gravity section of the dam, where it joins the arch section, can be seen to the left of the picture. The streams known respectively as Water of Deugh and Bow Burn would naturally flow directly into the River Ken above Kendoon. A dam, however, was built first across Bow Burn. This is a gravity dam 145 feet long. It is slightly curved in plan, the radius of the upstream face being 500 feet. A culvert which is formed in the body of the dam lends the water to an open aqueduct which has a bottom width of 3 ft 6-in. The aqueduct has a gradient of 1 in 400 along its length of 2,800 feet. The aqueduct leads to the reservoir formed by the dam across the Water of Deugh. This dam, which is of the same general construction as the Bow Burn dam is 185 feet long. The aqueduct ends in a stepped channel which empties the water into the reservoir. STEEL PIPE with an internal diameter of 13 ft 6-in connects Kendoon Power Station with the reinforced concrete aqueduct leading from the Blackwater dam. The pipe line is 700 feet long and the aqueduct more than 2,800 feet long. As in a tunnel, provision had to be made for coping with a surge. The surge tower seen in this photograph is 85 feet high. The sections of pipe were delivered in half-cylinders 8 feet wide and riveted together on the site. The combined waters of the Bow Burn and the Water of Deugh are carried in a tunnel 7,000 feet long from the Water of Deugh dam to Carsphairn Lane. The floor of this tunnel is built on a radius of 12 ft 9-in. Floor and walls are lined with concrete, but for the most part the roof is formed by the natural rock. The tunnel emerges from the hillside at 740 feet above Ordnance Datum and flows through an open aqueduct which is 300 feet long. The other end of this aqueduct is 15 feet lower and, to prevent the water from acquiring an undue velocity in this comparatively rapid descent, a series of steps has been formed in the aqueduct to act as small waterfalls. At the end of the aqueduct the water descends into a settling tank 72 feet long and 35 feet wide. The downstream end of the tank, which is of concrete, is built in the form of a low dam. Over the crest of this the water flows down a slope through a transition section into a covered aqueduct of reinforced concrete, with an internal diameter of 14 ft 2-in. This aqueduct is 300 feet long and is connected to an 8-feet diameter steel pipe which leads from the Loch Doon tunnel. The steel pipe line is formed in 8-feet lengths of single sections of steel plate, bent to a circle. MASSIVE FLOOD GATES were incorporated in the gravity section of the Earlstoun dam. 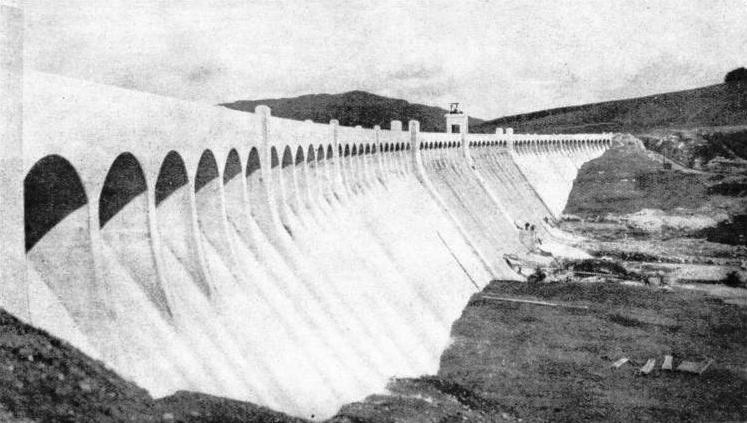 Spillways were provided along the 417 feet length of the gravity dam, but these alone would have been insufficient to lead off all the flood water. The flood gates of the Eartstoun dam have a span of 17 ft 6-in and can be raised to a height of 25 feet. The intake of the Water of Deugh dam is higher than the water level of Loch Doon, so that the series of pipe lines, aqueducts and tunnels which joins them forms a siphon with its lowest point at Carsphairn Lane. At this point there is also an outlet which discharges into the Ken Valley system. Normally, the flow of the water is from the Water of Deugh into Loch Doon and the outlet to Carsphairn Lane is shut. When the water stored in Loch Doon is required by the Kendoon turbines, the outlet valve at Carsphairn Lane can be opened to discharge water not only from the Water of Deugh but also from Loch Doon. The waters in Loch Doon, therefore, serve as an additional supply for the power stations when the local sources of water supply are low. The waters are used mainly in summer or at other dry periods. 140 ACRES OF WATER are impounded by the Earlstoun dam. Water for the Earlstoun turbines is drawn from the eastern end of the dam by a canal 1,200 feet long. The main supply for the Kendoon power station comes from a series of reservoirs built in the vicinity of Kendoon. A dam, 780 feet long, has been built across the Water of Deugh at a point about two miles above its confluence with the River Ken, where the river makes a sharp bend to the south and flows on a course almost parallel with that of the Ken. By damming the Water of Deugh at this sharp bend, the engineers have made the waters rise over the saddle between the two rivers and fall into the Ken. Where a deep gorge has been scoured by the Ken another dam has been built, with a crest 85 feet above the stream. This dam has raised the level of the Ken, so that part of the saddle between the two rivers has been submerged and one reservoir formed. Between this reservoir and the Kendoon power station a stream known as the Blackwater Burn flows down into the valley from the east. To collect this water a system of aqueducts and a dam have been designed. The outlet from the Ken reservoir is made by an open canal, which runs for 2,500 feet from the eastern shore of the reservoir near the dam. The canal is lined with concrete and has a bottom width of 10 feet. The canal runs into a reservoir which has been created by building a dam across the Blackwater Burn. The source of this burn is Loch Whinnie, which acts as a natural supplementary storage reservoir. From the Blackwater dam the water is taken into a reinforced concrete conduit with a diameter of 13 ft 6-in. This conduit or covered aqueduct was laid in a trench excavated by a digger. After the trench had been excavated an invert of concrete was laid. Steel for the reinforcement of the lower section of the aqueduct was then laid, and the surface was finished. The next step was to lay rails along the invert to facilitate the completion of the upper section of the aqueduct. NEARING COMPLETION of the arch section of the dam at Earlstoun, on the River Ken. No spillways were built in this section of the dam. 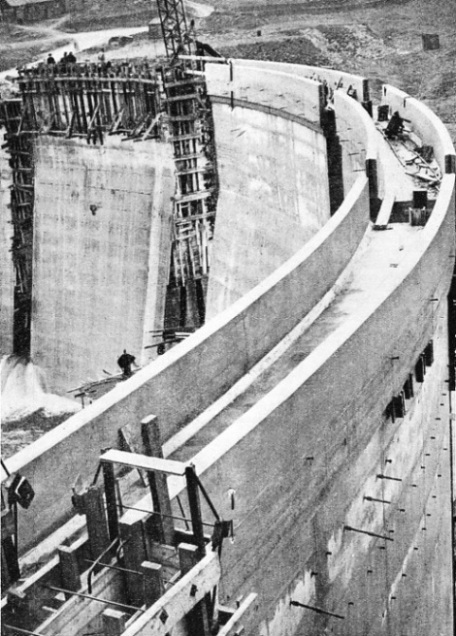 The dam was built in sections with spaces between so that full allowance could be given to the contraction of the concrete on cooling. At a distance of about 2,800 feet from the Blackwater the aqueduct joins a steel pipe line of the same diameter through a surge tower 85 feet high. This pipe extends for 700 feet to the bifurcation above the power station at Kendoon. This power station is the largest of the three in this section of the scheme, and has a capacity of 21,000 kilowatts. The turbines are housed in a building which has a structural steel frame. As soon as the steelwork had been erected, the roof, which consists of pre-cast concrete slabs, was placed in position. 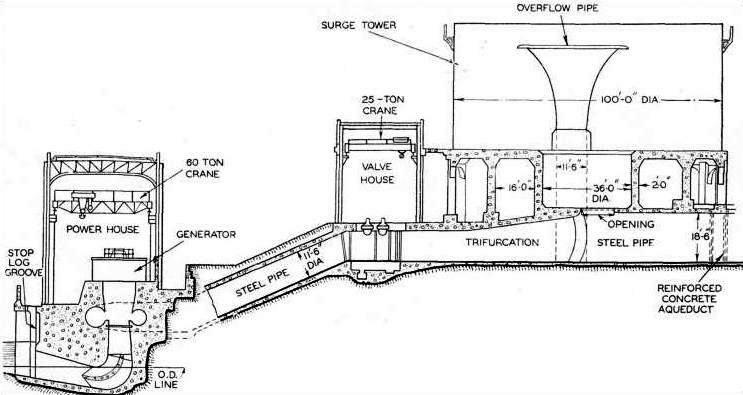 A 60-tons travelling crane was then mounted to handle the machinery, which could thus be installed in the power house before the walls of the building were in position. The generating plant consists of two vertical-shaft reaction turbines, each of which was designed for a normal output of 14,000 horse-power and a maximum output of nearly 18,000 horse-power. The spiral casings are directly connected to the pipe lines. No intermediate stop-valves are necessary as the main valves a few yards from the power station are sufficient. The water from the turbines is discharged through the tailrace into the River Ken. Two miles downstream the water is again impounded by a dam to form a reservoir of 100 acres. This is the Carsfad dam. The dam has a total length of 1,270 feet and is horse-shoe shaped in plan. The western arm of the dam forms the eastern bank of the intake channel. Water from this reservoir is carried to the Carsfad power station through twin reinforced aqueducts laid in trenches in the same way as the aqueduct which leads to the Kendoon power station. The tailrace from the Carstad power station carries the water back into the River Ken. Farther downstream the Earlstoun dam forms another reservoir, which has a water area of 140 acres. AT THE NORTHERN END OF LOCH DOON a dam was built to impound all the waters in the loch so that they could be diverted into the Ken watershed through a tunnel. The dam raised the level of Loch Doon by 27 feet and increased the water area to 2,250 acres, thus storing 15,000 million gallons of water. This dam is the only one in the Galloway Power Scheme which carries a road. The Earlstoun dam is also of the combined arch and gravity type. The gravity section, 417 feet long, includes all the spillways. As these were insufficient to deal with all the flood water, two massive flood gates were embodied in the gravity dam. These gates have a span of 17 ft 6-in and a height of 23 ft 6-in. Two 5-horse-power 400-volts motors lift the gates, when necessary, to a height of 25 feet. The arch section of the dam, 282 feet long, is built on a downstream radius of 145 feet. A canal 1,200 feet long leads from the Earlstoun reservoir to the intake works. This canal, which was formed partly by excavation and partly by building a retaining embankment, leads to the entrances of a pair of 13 ft 6-in aqueducts 270 feet long. These aqueducts are directly connected to the spiral casings of the turbines in the power station. The generating plant at Carsfad is identical with that at Earlstoun. Either station contains two vertical shaft reaction turbines coupled to three-phase alternators each with a normal output of 6,000 kilowatts at 11,000 volts. These are the only two stations in Scotland which can be operated without any attendants. The turbines are started up or shut down automatically from Glenlee Power Station. WORK IN PROGRESS on the reinforced concrete covered aqueduct which leads from the Deugh tunnel to the pipe line connecting with the Loch Doon tunnel at Carsphairn Lane. The aqueduct has an internal diameter of 14 ft. 2 in. and is 200 feet long. First a trench was excavated and the concrete invert laid. Circumferential and longitudinal reinforcement gave additional strength against varying pressures. The Earlstoun tailrace leads into the River Ken, which now flows unimpeded, past Glenlee Power Station, into Loch Ken. At this point the water becomes controlled for use by the lowest of the five power stations in the Galloway scheme, that situated at Tongland. The level of Loch Ken has been raised 6 feet by the building of a barrage across the lower end near Castle Douglas. The Gleulochar Barrage, as it is called, consists of eight reinforced concrete piers. The structure is 338 feet long and 35 feet high, providing six openings 45 feet wide. These openings arc closed or opened by three 10-feet and three 9-feet gates, according to the contour of the river bed. These gates, which weigh 11 tons each, were transported from the makers’ works to the site complete on a special lorry, whose overall length, with load, was about 70 feet. TONGLAND POWER STATION contains three turbines which are fed through individual branches of pipe line from the trifurcation under the surge tower. The pipe lines, each 11 ft 6-in in diameter, lead through the valve house. The pipe lines traverse a distance of nearly 80 feet to the spiral casings of the turbines. The surge tower at Tongland was built over the trifurcation of the steel pipe line which brings water to the three turbines in the power station. On a concrete base 42 feet high rests a steel tank 100 feet in diameter, bringing the total height to 91 ft 6-in. An opening just before the trifurcation leads into a chamber 36 feet in diameter. Additional surge rises through into the tank, from the top of which a discharge pipe leads to the turbine tailrace and so into the River Dee. Seven miles farther downstream a dam was built across a deep and narrow rocky gorge through which passes the River Dee, as the Ken becomes when it leaves Loch Ken. The total length of the Tongland dam, which impounds a daily supply of 13,000,000 cubic feet of water, is 950 feet, and it rises about 70 feet above the original level of the river. The dam is of the combined arch and gravity type. The bed of the River Dee is blocked by an arch dam 293 feet long, built on a radius of 145 feet. The western bank of the river is a steep cliff more than 100 feet high, and the western extremity or abutment of the dam was built into the face of this cliff. The eastern end of the arch dam connects with the gravity type dam, which extends for 200 feet across what was an area of low-lying land. From the eastern end of the gravity dam a structure runs at right angles. This structure carries the flood gates and beyond them are the spillway and the spillway channel. The dam is built of mass concrete with no reinforcement. 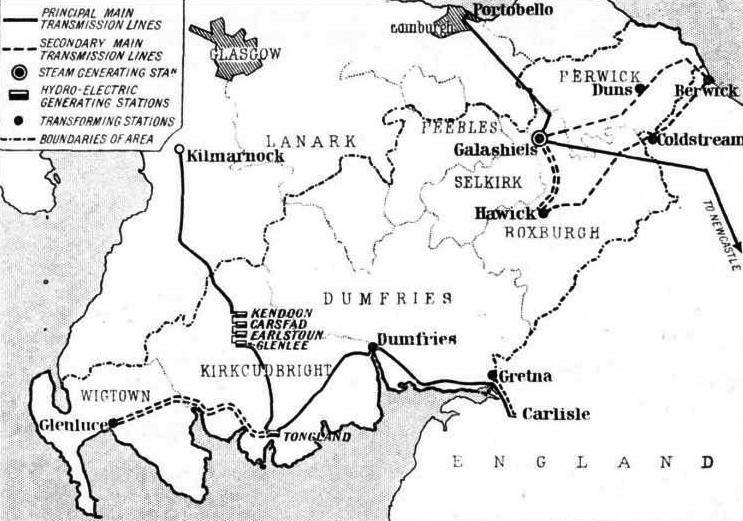 The power required for drawing the machinery used in building this dam and the other dams and tunnels in the scheme was obtained from the Carlisle-Kilmarnock line of the national network of the Grid. A valve is provided in the arch section of the dam, as in all the dams, to enable the reservoir to be drained if this should be necessary. In front of the valve is an emergency roller gate which has a span of 6 feet and a depth of 7 ft 3-in. POWER FROM THE GALLOWAY SCHEME is transmitted from the Southern Scotland area of the national Grid network to Central Scotland and north-west England. The transmission lines and transforming stations are shown on this map. In addition to the five Galloway hydro-electric power stations, a steam station at Galashiels, Selkirkshire, also supplies electricity. It is formed by a series of steel rollers which rotate on axles held between mild steel frames. The spaces between the rollers are protected by secondary brass rollers which the pressure of the water holds hard up against the steel rollers. As the gate is lowered the rollers rotate. When the gate is closed the only seepage of water comes through the fine clearance between the rollers and the frame. Two large flood gates are built at the east end of the gravity section of the Tongland dam. These gates are 31 feet high and have a 25-feet span. Either gate can be lifted a clear height of 33 feet by a 6 horse-power 400-volts three-phase motor which drives a spur reduction-gear headstock and horizontal shaft through bevel gearing A concrete apron leads the waters from the flood gates to join the water from the spillway channel and return to the Dee at a point below the arch dam. Just above the western end of the dam an opening 110 feet wide in the banks of the reservoir forms an intake which leads water into a tunnel 480 feet long. 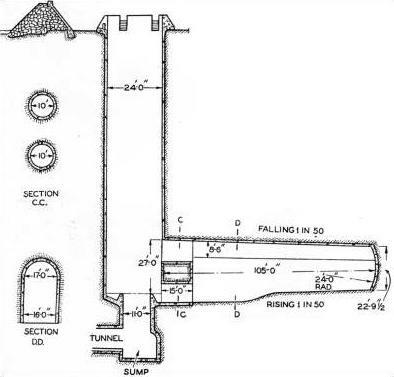 The tunnel, excavated through rock and lined with concrete, is of elliptical section with axes of 22 feet and 18 feet. The tunnel is connected to an aqueduct of reinforced concrete which leads to a surge tower 3,335 feet away from the end of the tunnel. In the surge tower water enters a pipe line which trifurcates. Each of the three pipes runs through the valve house and thence to the turbines which are situated in the power station nearly 80 feet away. Tongland Power Station came into operation in May 1935. The River Dee is a salmon river and, despite the control of its waters for use by man, full provision has been made for the fish. Special passes, known as fish ladders, have been built to provide access past the dams and barrages for the fish. The ladders resemble a flight of stairs with landings formed at intervals by large resting pools. The fish ladder round the Tongland dam follows a curved path and rises to a total height of 70 feet in thirty-six steps. These steps are arranged in five flights with four resting pools between them. The rise from step to step is about 2 feet, and the water flows through an adjustable orifice in each cross-wall, which forms the step, 2 feet into the pool below. The five power stations of the Galloway scheme have an aggregate capacity of 102,000 kilowatts. This output is mainly exported to the South Scotland grid network, which supplies an area of 4,308 square miles. The only other power station which supplies electricity to this section of the Grid network is a steam station situated at Galashiels, in Selkirkshire. THREE TURBO-ALTERNATORS in Tongland Power Station are each designed to give a continuous maximum output of 17,500 horse-power. At this load the quantity of water passing through is 46 tons a second. 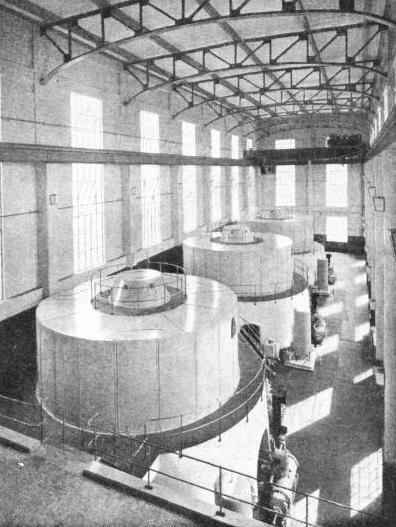 These turbines were the largest of their kind installed in Great Britain when the station was opened in 1935. The turbines are coupled to three-phase 11,000-volts alternators. You can read more on “Britain’s Electric Power Supplies” and “The Shannon Power Scheme” on this website.